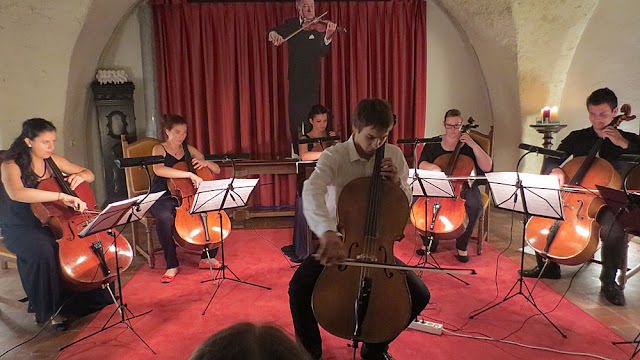 A severe case of cello twirling broke out last night in Bled Castle during the final concert of Festival Bled. 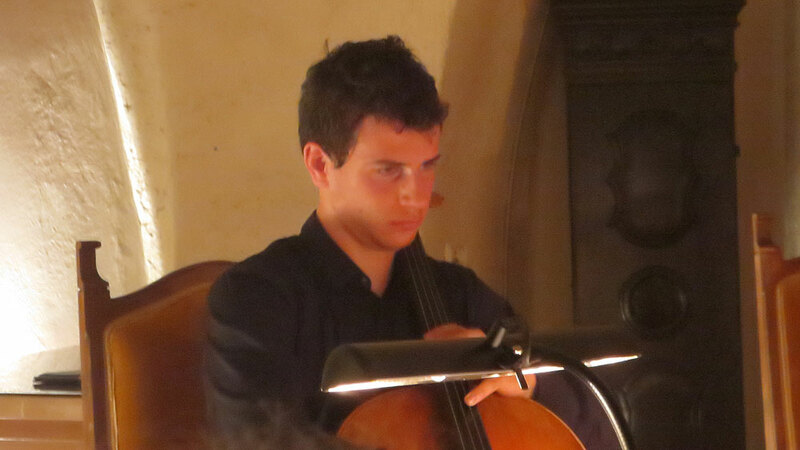 The outbreak began towards the end of the concert when cellist (well, they were all cellists, weren’t they?) Vita Peterlin gave her instrument a quick twirl. 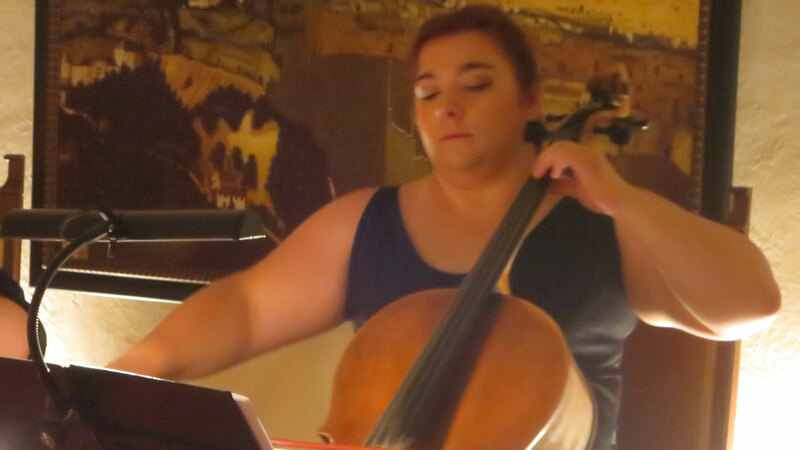 Other members of Cello Attacca were seen – during one of the three encores – giving their instruments a celebratory twirl, too. Please note — 3 encores. back in the Barons’ Hall at Bled Castle and in the audience again young children, families, holiday makers, and I see some of the performers from earlier in the week. Tonight there is a little package waiting for me — the sound tracks from previous Festivals. Thank you. The first time we get to hear seven cellos play at once is in the second piece with soloist Urban Megušar in Girolamo Frescobaldi/Gaspar Cassado: Toccatta. This is late baroque/early renaissance music from about 400 years ago and may well be something played in Bled castle around that time. in the world.” (Leonard Rose). We are being taken on a journey. We might not know it, but we are being led along an interesting path. We have had the pop starter. Good old Mozart. The message here is “Nothing to worry about, folks. It’s just music.” Then we are seduced by the romantic. Now it is time we were challenged. This is not easy music to play – but it is pretty exciting to listen to, A secret is being revealed – an important one. 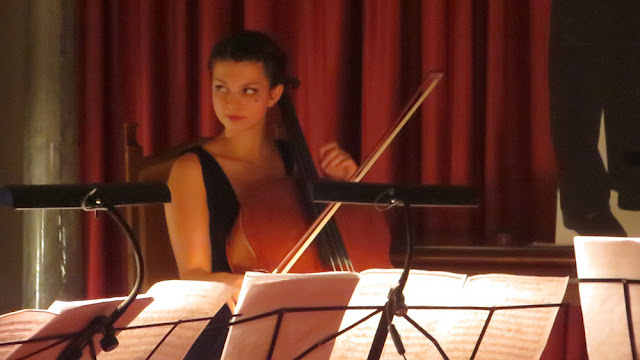 Whether it is a full classical orchestra, a school concert a folk gig – whatever. Where there are performers and an audience this holds true. A truly enjoyable concert is not about a programme that says “Here is our music – you may listen as we play. We want to impress you”. OK, that has its place – sometimes we want to be impressed. A truly enjoyable concert is about the musicians saying “This is the music we love, we want to share it with you, we want you to love it too. We are the medium, the composer has sent this message.” That is the key to a perfect concert. 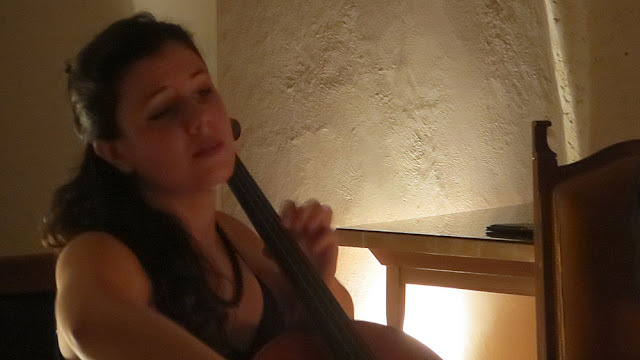 Classical, Jazz, Rock, Folk — it doesn’t matter. First we must love the music. Then we are into 20th and 21st century music by David Johnstone, a contemporary composer from England living in Spain. Ms Peterlin takes to lead on this piece. 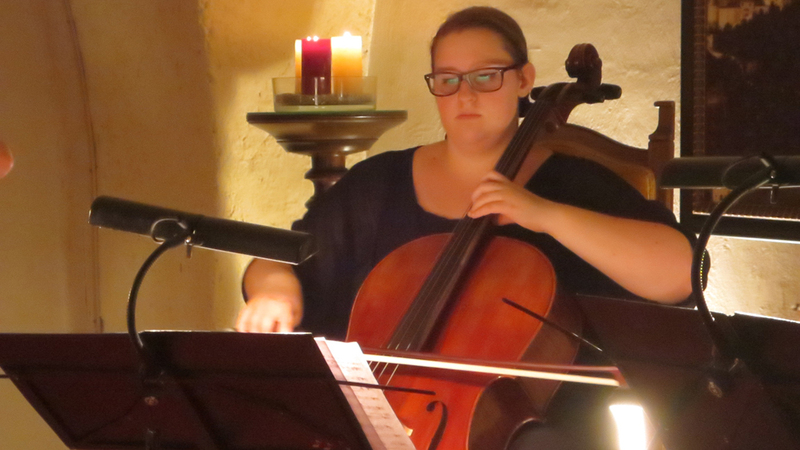 I really enjoy watching these musicians exchange glances at each other – they take cues, they all but wink and flirt. But in each piece there is a leader. Twirly Ms Peterlin leads this. 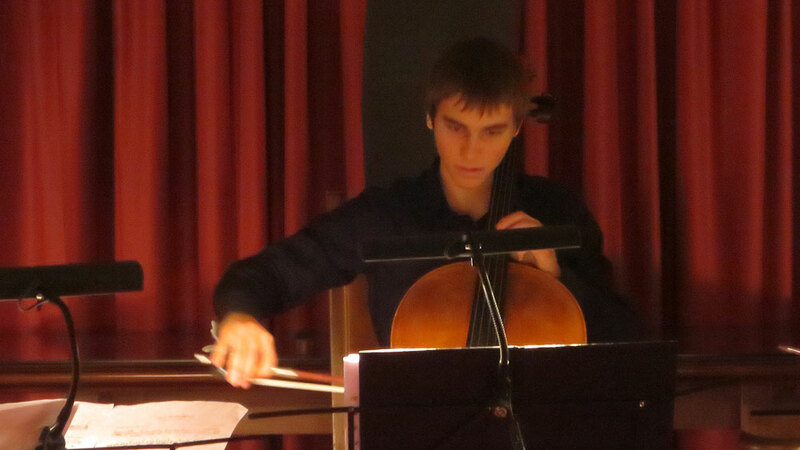 There is not enough cello twirling these days. Can we have more. please? It is so rock’n’roll. I have so much music to explore over the winter.